Libertas Guest Farm - The Dairy - Wilderness Accommodation. 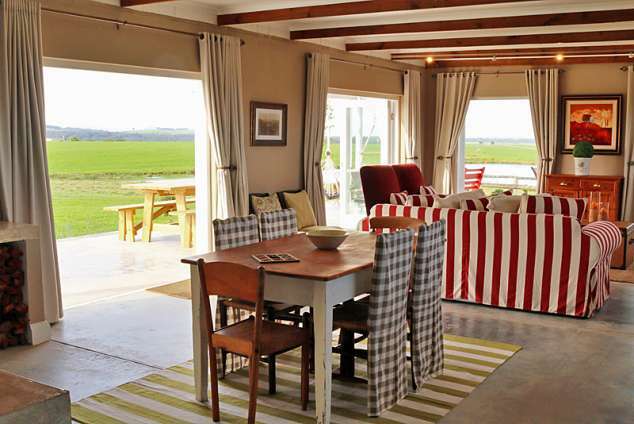 The Dairy: this old dairy was turned into spacious accommodation and accommodates 6 guests. The natural beauty of this area as well as the many tourist attractions will ensure a memorable stay. Libertas is located close enough to all the best tourist attractions the area has to offer, but still allows for a quiet and relaxing stay in the countryside. We are conveniently located 14km from the town of Sedgefield and 15km from Wilderness village. George Airport is only 40km from the farm along free-flowing traffic on the N2 - no traffic congestion in this area (except for the odd dairy herd passing at times). 2 Bathrooms (one is en-suite). Both have only showers. Please note: No bath available. Open-plan kitchen and lounge area with stacking doors and french doors leading onto stoep with braai. A Dover stove in the open-plan kitchen/living area which heats up the whole house during winter times and a farm pool with wooden deck which is a hugely popular spot during hot summer days or even during winter to enjoy star-gazing at night. Farm pool filled with fresh water from our river source. Wooden pool deck with pool loungers & cushions. Please note: there is a farm dam ±100m from the house which is not fenced off. Huge open space around the house allowing for free-range kids to enjoy the fresh farm air and to introduce themselves to the local calves, cows, chickens and cat. Cricket bats, soccer balls, beach bats, swingball, etc. to have some outdoor fun on the lawn. All linen (100% percale cotton) and towels are provided. 2871 page views since 08 Apr, 2016.